So far in 2018, we have had lots of positive feedback on our continuing series showcasing vintage and old snowmobiles. So far in 2018 we have had lots of positive feedback on our continuing series showcasing vintage and old snowmobiles. We call the popular series The Old Sled Zone. We are confident this reflects both the nostalgia and passion snowmobilers continue to feel about these vintage machines from a bygone era. We are pleased to re-post the “most liked” of the vintage sleds we have posted during the first 6 months of 2018 – based on the number of Facebook likes each posting received. With 866 Facebook likes, this article takes the number four spot: Old Sled Zone — Vegreville Antique Snowmobile Show & Shine. Billed as the Vegreville “Father's Day” event, this show and shine meet attracts a big and enthusiast crowd – from near and far -- to view all things motorized at the local fair grounds. In case you don't know where Vegreville is, it's a small Alberta town located on Highway 16A approximately 100 km east of Edmonton. Calvin Robinson and his vintage snowmobile buddies from the Alberta Relic Riders put on a great display of antique, vintage and classic snowmobiles. Calvin was kind enough to share a photo of his old sled on display at Vegreville last weekend. There were everything from Alouettes to Zany classic race sleds on display. So if you missed this year's event at Vegreville, mark your calendar for next year, now! 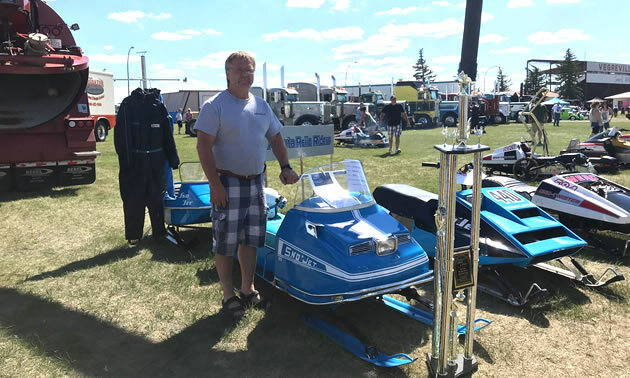 We asked Calvin about his favourite sled at the show, he said, "I have to say, I really like my 1970 Sno-Jet Super Sport and lots of people voted it the people's choice." We tend to agree — great looking '70 Sno-Jet! Way to go, Calvin and all the Relic Riders who participated in the show.